Alfred Wegener and continental drift: Crackpot or heretic? It is not uncommon for writers who wish to disparage science to refer to Alfred Wegener and his theory of ‘continental drift’. People laughed at him, they say, and ridiculed his ideas, and they are not laughing now. The establishment saw continental drift as a crackpot theory, or a threat to some existing theory. He was a heretic against the scientific establishment, and did not live to see his ideas triumph. Here is another example of how science is only, or only a little better than, a set of opinions of scientists that can be overthrown at any time. What is called ‘science’ is just the opinion of the majority of scientists in a field, and a plucky loner (Wegener was not a geologist) may eventually overthrow the established opinion and receive the credit he deserves. This view of science is particularly comforting to religious extremists, postmodernist philosophers and science-deniers of all stripes (climate change, AIDS, vaccines, and so on). Quite recently, Matt Ridley, who used to be an admired science writer in his own field of biology, invoked Wegener (amongst others) as an example of a heretic who was persecuted by scientists but eventually triumphed. This is by way of lauding a ‘sceptic’ who Ridley thinks (without presenting any evidence) will one day show that humans are not causing global warming. Perhaps I’ll come back to Ridley later. For this occasion I want to comment on Wegener, and I’ll start by stating some facts. Wegener’s theory was taken seriously by geologists, even though they were rightly sceptical. Wegener was not a heretic, because he had nothing to be heretical against. Wegener was not the father of plate tectonics, which is not the same thing as ‘continental drift’. Let’s consider the state of geology in Wegener’s day, around 1915-30. The world had been mostly mapped, and many geological structures around the world, particularly those of potential economic value, had been mapped too. The main geological periods had been identified, many rock strata had been placed in their correct order and some absolute dates had been obtained using radioisotopes, showing that the world was much older than previously thought, even though the dates were not as accurate as those we have now. The geological discoveries tied in with the paleontological (fossil) discoveries, which were explained by evolutionary theory. But there were lots of puzzling observations of the earth that could not easily be explained. The apparent ‘fit’ of the outlines of some continents – and, particularly, the rock formations on each side – was just one of them, the one that engaged Wegener. But there was much more. Why were there mountains, if the earth is as old as was now known? It was known that the processes of erosion of rocks would remove mountain ranges in tens or hundreds of million years. Why are the largest mountains in the huge Alpine-Himalayan and Andes-Rockies ranges? Why are these ranges made up of sediments – as identified by the fossils in them – that had apparently been deposited in submarine trenches called ‘geocynclines’ tens of kilometres deep? And where are the geosynclines of the present day, and if there are none, why not? Why are there volcanoes and earthquakes, and why are they located where they are? Why do some rocks show glaciation in the tropics and others show tropical life in the polar regions? Did the rocks move, or did the climatic zones? And so on and on. It’s important to remember that a lot of details we now know were not available then and did not become available till the 1950s and 1960s. One particularly important clue that was missing was that the ocean floors are very much younger than most of the continental rocks, less than about 200 million years old, and were formed by spreading from ridges of volcanic activity, such as the Atlantic mid-ocean ridge. Another important detail that needed to be understood is the structural relationship between the continental shields, the oceans and the mantle beneath them. There were actually many theories for some of the phenomena, but nothing that explained it all. In such a case, scientists are right to be sceptical. We tend to consider theories better if they bring together lots of isolated observations into one consistent body of explanation, as evolution does in biology and quantum theory does in physics and chemistry. There was no such thing proposed at that time for geology (evolution dates of course from Darwin’s time and the foundations of quantum mechanics were mostly laid in the 1910s/20s). 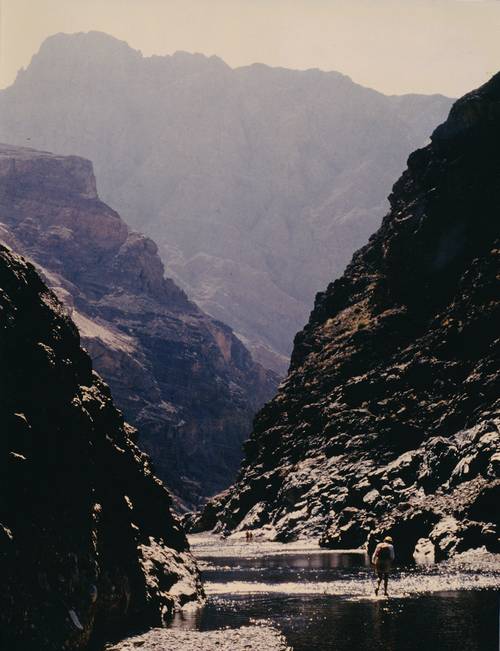 Some years ago I was on one of many field trips in the mountains of northern Oman. These offer some of the most spectacular (and visible, given the desert climate) geological displays in the world. Vast sheets of rocks, many of them from the bed of a long-gone ocean, and some of them from deep in the volcanic ocean crust, have been thrust far inland over an older land surface, in some places rucking up the older rock into mountains thousands of metres high, like a vast carpet on a slippery floor. One of the other participants, an FRS in geology, commented that until the coming of plate tectonic theory the only available explanation for this, and all the rest of geology, was magic. One thing to remember is that a theory must explain those observations that are, on the face of it, inconsistent with the theory. For example, ‘continental drift’ explains why some facing shorelines approximately fit (for example, eastern South America and south-western Africa) but what about those many shorelines that don’t fit? Another thing that was missing was a mechanism for continental drift. To accept causal relationships, scientists want to know the exact mechanisms by which one thing causes or relates to another. In Wegener’s own field of meterorology, the underlying physical mechanisms of the weather were already known. In the early 20th century, lots of fundamental work was going on into how chemical reactions occur (their mechanisms). Nowadays, there are scientists studying the mechanisms of genetics and how organisms develop. Wegener had nothing to offer on these lines regarding how continental drift occurred. Crucially, there was at least one other theory that seemed to explain the observations and it was probably more acceptable at first than continental drift, although it faded as more evidence came in. That is, that the continents were originally connected, but that the land between them had foundered beneath the sea – perhaps more plausible, in the absence of relevant evidence, than moving continents! This other theory eventually was disproved by the finding that the ocean floors are of very different material from the continental shelves. There is a book reviewing the state of earth science around the time of Wegener’s death (J A Steers, The Unstable Earth, 3rd ed 1942, originally published 1932) which devotes many pages to discussing continental drift and the evidence relating to it. Clearly the theory had been taken very seriously but as it was incomplete and had at least one rival theory, geologists were right to be sceptical. In fact (as Karl Popper explained) it is right and proper to be as critical as possible of any theory, as it is the one that survives criticism the best that eventually prevails. No doubt Wegener experienced personal remarks and academic bitchiness, but he probably didn’t receive much worse than other proponents of conjectural theories receive. (Incidentally, the objections to Semmelweiss – another of Ridley’s ‘heretics’ – were probably much to do with his attitude and behaviour towards other physicans). And what theories the Steers book contains! There are many, covering different aspects of geology, and some of them seem pretty strange to us now. For example, there was a theory that the earth had a tendency to collapse into a tetrahedral form, at the same time creating the force that pushed up mountains. This was based on the observation that the main continental shields of the earth form approximately the corners of a tetrahedron, which we now know (whether it is true or not) is no more than a coincidence and a red herring. Much of the theorising in the book is based on the suggestion that the earth is contracting through cooling. The book makes it clear that at that time the evidence was stacking up in favour of continental drift and the theory of land bridges was losing favour. Wegener’s theory is given at least the same prominence of that of a prominent expert on earthquakes, Harold Jeffreys, who proposed that the earth was undergoing thermal contraction. The mechanism of what would later be called plate tectonics (attributed to Arthur Holmes) is also discussed in the book in rudimentary form – the idea that continental plates are mobile on the mantle beneath them. Before plate tectonics, geology was a mass of unexplained and puzzling phenomena and various theories were widely debated. It was plate tectonics that brought them all together in one wide-ranging and unifying and satisfactory explanation. This happened in the 1950s and 1960s. I won’t go into it here as there are plenty of places where you can read about it. But plate tectonics is much, much more than just ‘continental drift’. Wegener made a contribution to our later understanding – which he did not live to see as he died on an expedition to Greenland studying Arctic weather (his own research field). But there is no reason to regard him either as a heretic or a victim of unreasonable doubt. [BPSDB] In the wake of the latest outrageously dishonest headlines misquoting Phil Jones, the excellent Open Mind blog presented a good account of the error, and also initiated a civilised and productive discussion on how to present the facts to the general public. I urge you to read it. I hope to post some thoughts of my own on this in the near future.